Track riding has always scared this writer and I have consciously avoided the same over the years, despite wanting to learn desperately. Not because I'd be bad at it, but due to the fact that getting into a riding suit is a task with my rather gargantuan size. 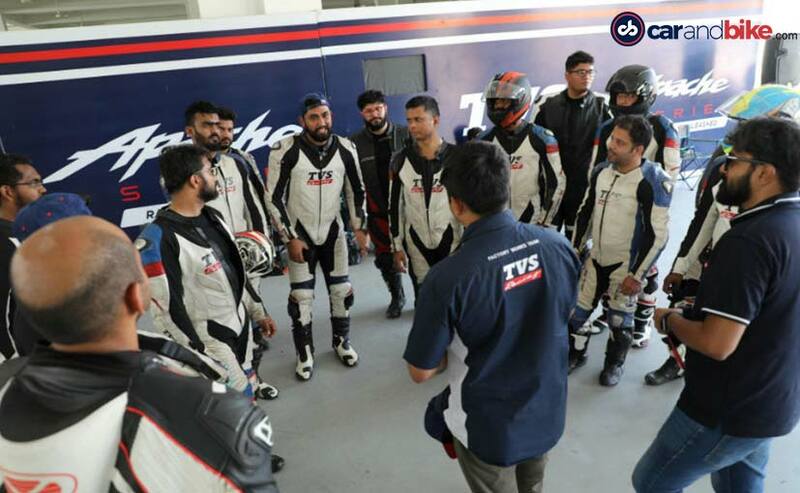 So, when I was nominated in the office to attend the third edition of the TVS Young Media Racer Program (YMRP), the first thing I did was call the TVS folks to arrange for a riding suit that would fit me. The calls were persistent, and I insisted that I needed the largest possible size they could find. Every time the guys on the other side would calmly tell me that I just needed to show up with a Double-D ring helmet. Everything else was taken care of, and I did exactly that. 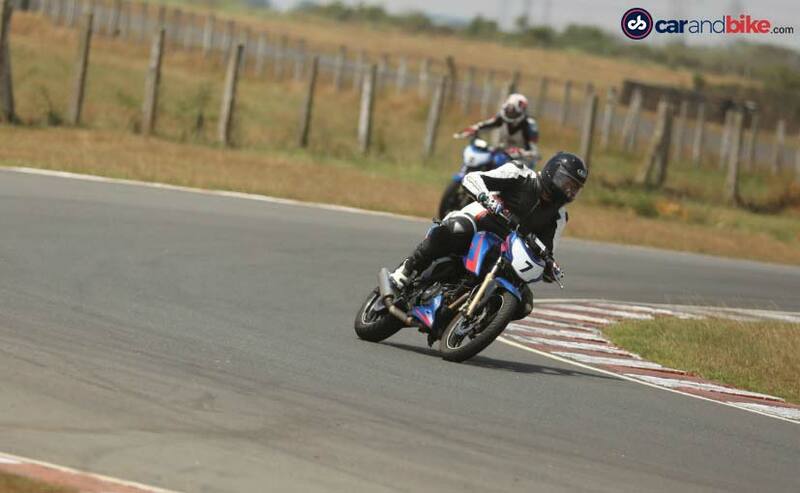 I made my way to Chennai for the new qualifying round of the racer program. 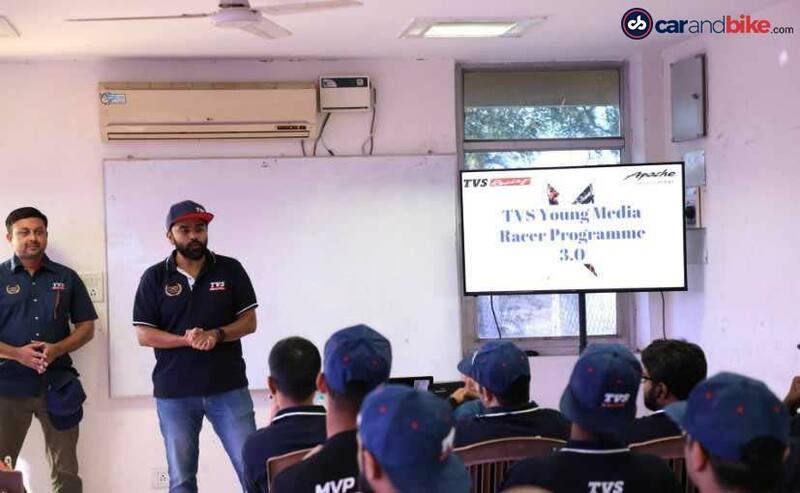 The TVS Young Media Racer Program started in 2017 and is an initiative by TVS Racing for budding media representatives to understand the skills and thrills of racing. Over the past two seasons, the initiative has trained and nurtured media persons for competitive racing against each other. 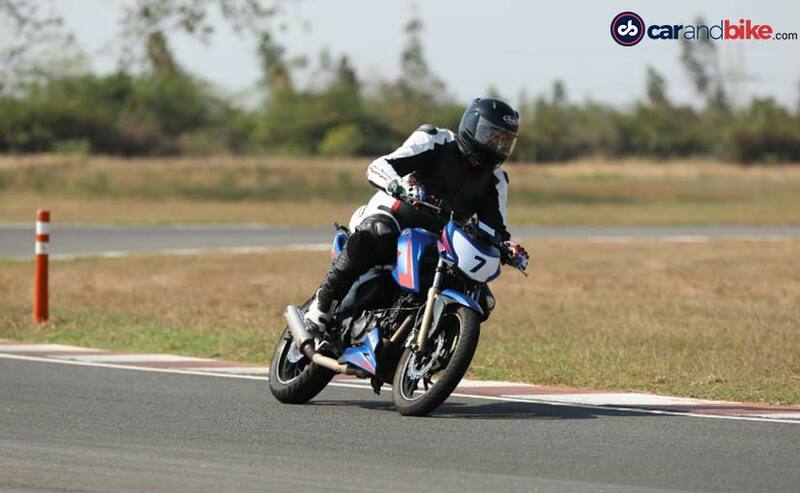 Representing carandbike, we joined the program for the qualifying session at the Madras Motor Race Track (MMRT), which would see 15 out 18 participants qualify for a full season of racing, astride the TVS Apache RTR 200 4V Race Edition 2.0. The race-spec version is stripped of some parts that makes it 15 kg lighter than the stock version. It also gets a remapped ECU, lighter clutch and a free-flowing exhaust that boost the power output to 24 bhp (20 bhp on stock version) from the 200 cc engine. The bike remains one of the best examples to come from the manufacturer's racing legacy, so what better machine to learn the basics of track riding on. 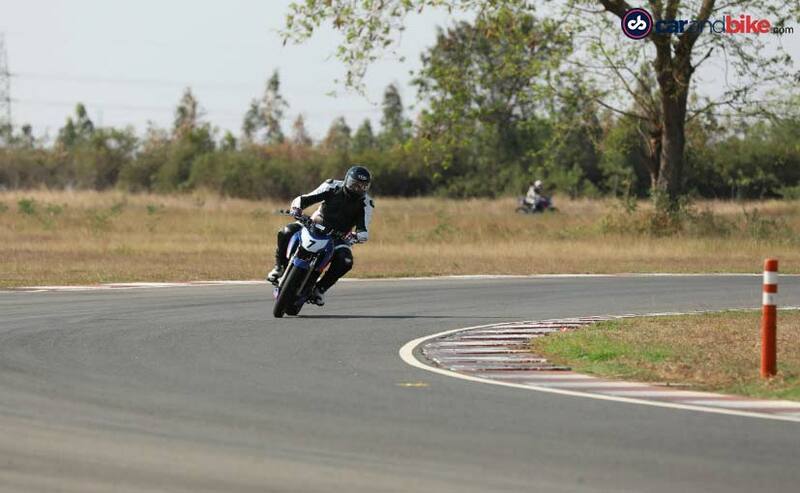 The day was divided into three classroom sessions followed by track riding, allowing us to practice what we learned. 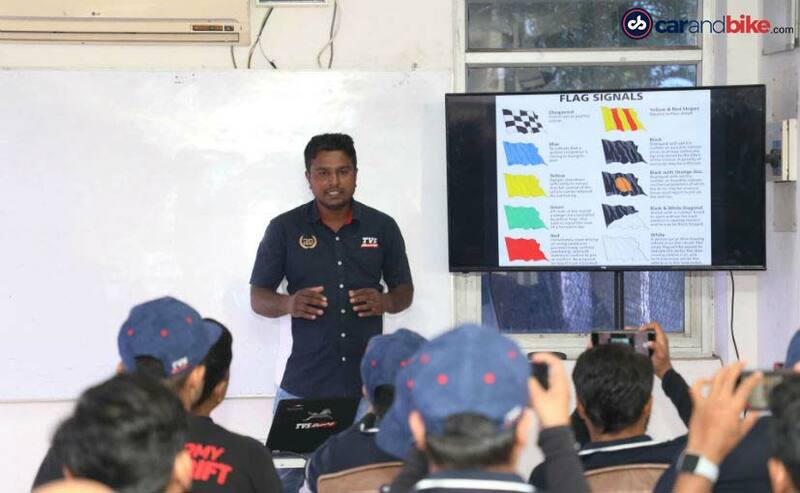 The first session had us riders learn about the basic rules and regulations of the track. These help keeping the participants, crew and the spectators safe. 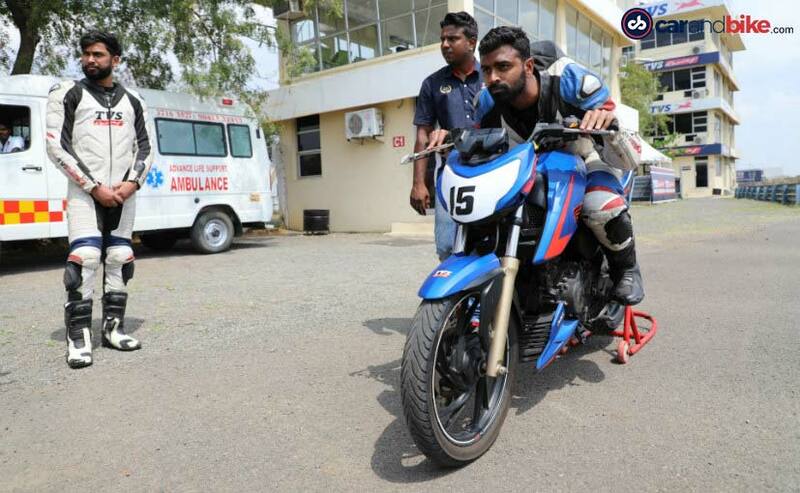 TVS racers Jagan Kumar, KY Ahmad, and Harry Sylvester were our instructors for the day. With multiple championship titles under their respective belts, we were in good hands! The classroom session started with the disclaimer telling us about the dangers of motorsport, followed by the importance of flags. There are more flags than the quintessential chequered one and each denotes an important sign on the track. While yellow means no overtakes, and red means that the race has been stopped due to an incident, the one to watch out for is the black flag, which means the rider is disqualified. Something you wouldn't want ever! The first track session had us keep things simple, which was to follow our instructor on the right racing line while using only the fourth gear. We weren't allowed to use the brakes at all. The session helped immensely in understanding how to take the right line. 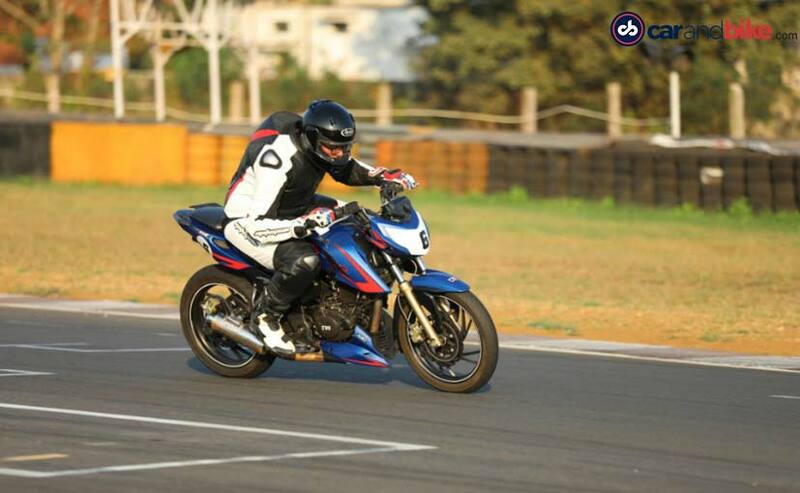 We got the chance to observe the instructor's body posture, throttle input and preferred lines on the track. Clearly, learning from the champions has its merits! Having the right body posture ensures that your lower body holds on to the bike, while the upper body is free enough to do the maneuvering. The position of your foot on the peg also makes a difference and can give you the agility to slide from side-to-side around a corner. And yes, you slide on the seat and not lift your arse, moving the weight dramatically. We were made to understand that this puts unnecessary pressure on the suspension setup, slowing you down. We wouldn't want that now, would we? As we hit the track with our "corrected" riding posture, the difference was stark in how easily the bike turned into corners. We were also allowed to switch between the third and fourth gears and tap the brake where necessary. Clearly, the right posture had us going faster as we familiarised ourselves more and more with the track. With the sun overhead and the Chennai heat almost getting to us, it was time for the last classroom session for the day. The instructors taught us about having the correct race start. An often-overlooked aspect from a rookie's perspective, the start can make or break your race. In case of the recently concluded Qatar GP, Andrea Dovizioso's brilliant race start put him in the lead right from Turn 1, while a bad start pushed pole-man Maverick Vinales down to P7, from which he could not recover. That's the difference a good or bad start can make. Much like MotoGP, the riders need to look out for the lights turning green and react to the same. Too soon and you've attracted a 10-second penalty, too late and you've lost your position. 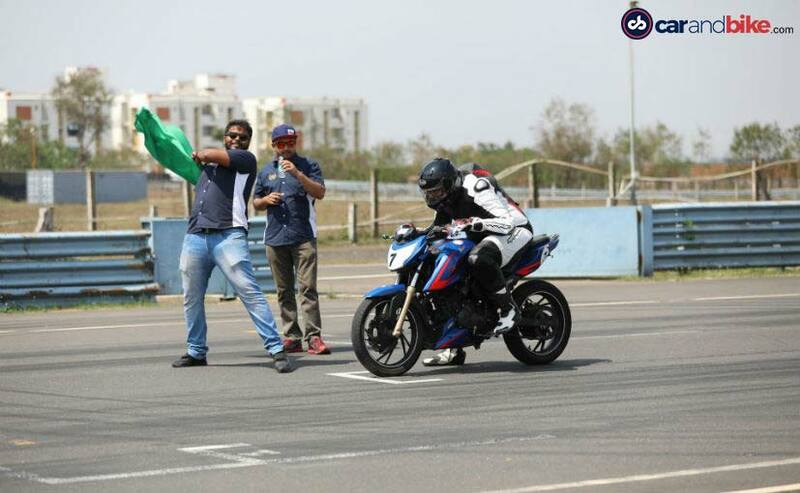 With all three sessions complete, all the riders were given about 15 minutes of 'free ride' on the track, practicing what we had learned through the day. Time had come that we put everything we've learnt to test. The qualifying session would conclude on the top 15 riders that would race in the upcoming season. 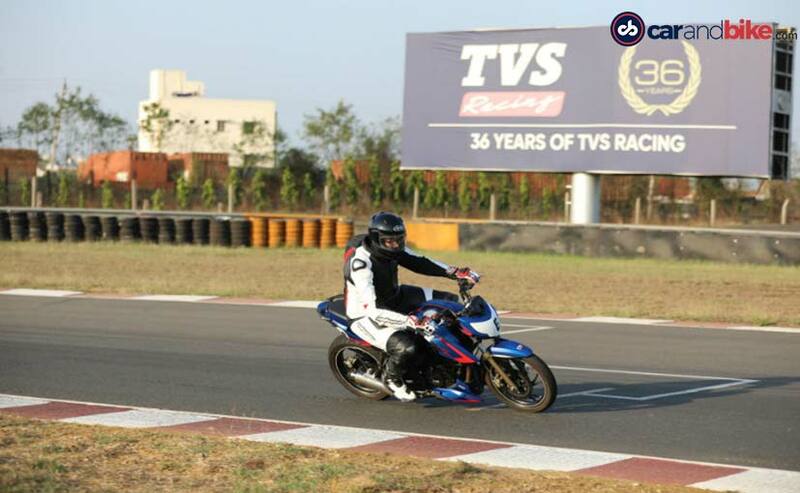 Riders were sent out in batches of five with the race-ready RTR 200 4V retrofitted with transponders. In all honesty, the goal for me was to qualify, even if it meant being the 15th fastest. "Can always improve as long as I get to play the game," I thought to myself. As I swung my leg over the Apache, everything I had learned came back to me. It felt like the board exams from school again, only this time I was actually prepared. The fastest lap time was 2.25.80s, and I was about 17 seconds slower than the pole-sitter. I turned out to be the 11th fastest, one second off making it into the top ten. Nevertheless, trimming those two seconds off my time and actually qualifying made for the right motivation to improve my skills. 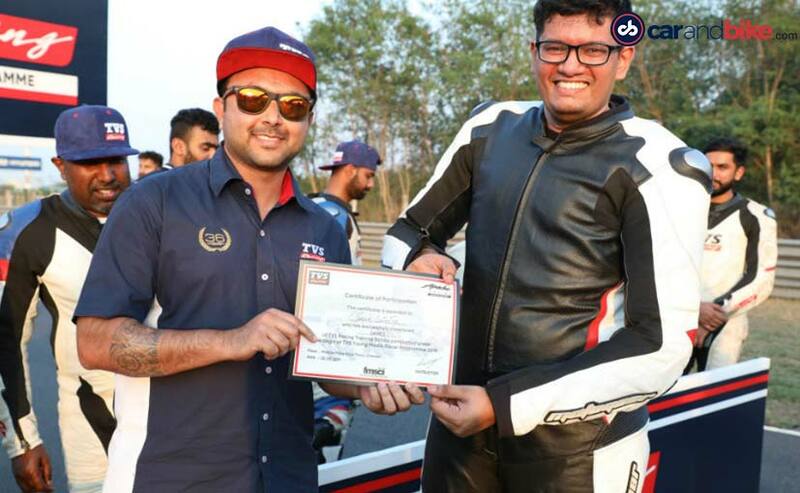 I'm eligible to compete in the full season of TVS YMRP 3.0 that will run as a support race with the Indian National Racing Championship (INRC). Scheduled for four rounds starting this June, the program will see us 15 journalists compete for the title. For those who couldn't make the cut, the team will bring them back as a wildcard entry during one of the rounds. The goal now is to lose weight, build strength and make it into the top 10. Bag a finish on the podium too, perhaps! And I know now, this isn't just wishful thinking. With three more training levels to go, TVS just might whip up the racer out and give my MotoGP moment.